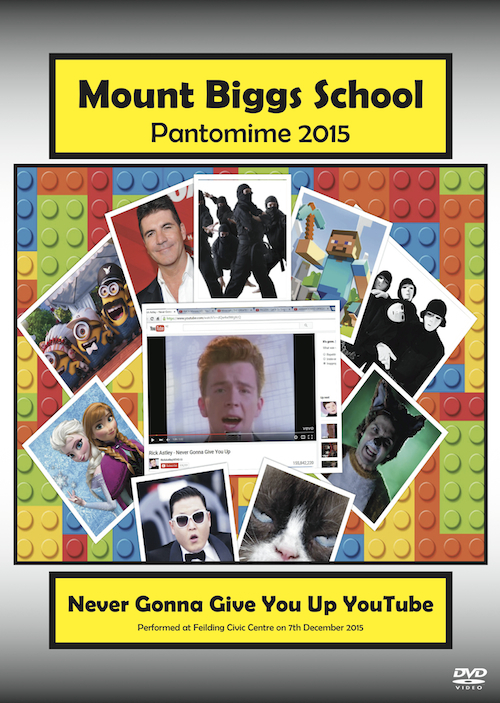 MOUNT BIGGS SCHOOL presented their 2015 school production, Never Gonna Give You Up YouTube! at Feilding’s Civic Centre on 7th December 2015. The audience was entertained by song, dance, and humour and Artisan Media was present to capture the moment. Being a small school, we worked hard to keep filming cost as low as possible but still managed to film with two HD video cameras and additional audio. We utilised Mount Biggs School’s artwork in the DVD design and DVD menus. To their surprise, they get ‘rickrolled’ and are transported into an alternative universe inside the Internet where they are taken through their computer’s YouTube history, visiting all their previously viewed favourite videos. With the Rickroll Ninjas beginning to wipe their favourite videos, our students engage with characters in the YouTube videos on their quest to bring the infamous Simon Cowell to justice and restore YouTube once again. Featuring music from hit songs Good Time, Let It Go, Lava, Unconditionally, Stairway to Heaven, and Skinny Love.